The progress of mankind has to a great extent been achieved by the sufferings of and sacrifices made by great and noble souls. Their insight into the higher laws and their realization of the Divine purposes. Their distresses and feelings for the suffering humanity and their endeavors to raise mankind to its proper place in the world have contributed to the maintenance of the highest moral laws and purposes of human life. History has preserved for the admiration of posterity many examples of such sufferings and sacrifices but the sacrifice made by Imam Hussein occupies a unique place in history. In Hussein and his small band of seventy-two faithful followers the entire humanity, irrespective of faith, finds an everlasting inspiration. No historian or a writer of any repute has ever asserted that Imam Hussein had at any time promised, or taken the oath of allegiance, to Yazid In fact the whole conduct of Imam Hussein was a stern repudiation of the claim of Yazid to the spiritual headship of Islam. The statement by Muir that Hussein had committed a breach of allegiance is inconsistent with his earlier statement that “the leading dissentients (to Yazid’s rule) at Medina were Al Husain, son of Ali, Abdul Rahman son of Abu Bakr and the two Abdullah’s sons of Omar and Az-Zubeir”. Hussein’s expedition was not a military insurrection or a rebellion against Yazid. The personnel of his expedition negates any suggestion that Hussein had any design upon Yazid’s throne. So long as Yazid did not claim the spiritual headship of the faith Husain had no cause to interfere with his monarchy. 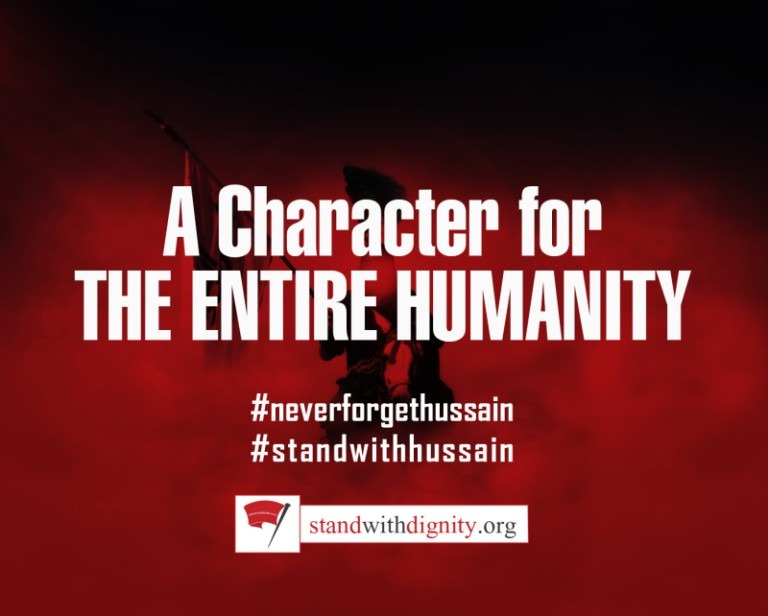 But when he asserted his title to be the Commander of the faithful and arrogated to himself the right to dictate the conscience of the Muslims by his depraved morals, a duty was imposed upon Hussein, as the grandson of the Holy Prophet of Islam, to denounce in unequivocal terms Yazid’s pretensions and to expose his wickedness to the world at large. Having meditated over the issue, he came to the conclusion that this could only be achieved by offering a sacrifice of such a magnitude as would cause a mental and psychological revolution amongst the faithful and awaken the masses from their lethargy and indifference to the damage that was being done to the faith. Having formulated his plan Hussein set out to put it into effect by fitting out an expedition against the tyranny of the pretender. Hussein’s expedition was the strangest in history. Accompanied by a mere handful of followers and a retinue of women and children, he set out to liberate the agonized humanity from the grip of the most tyrannical and powerful monarch of the age. He set out to die a death of martyr and thus open the eyes of the tyrants and capture the hearts of all mankind. He set out to rekindle the fire of faith and to water by his blood its parched roots. He set out, not with the intention of capturing the throne from Yazid but to establish the KINGDOM OF GOD on unhappy earth. The battle he fought was not a political battle. It was a battle between truth and falsehood, between fidelity and infidelity and between spirit and matter. This was the tyrant against whom Hussein is accused by Muir of having committed an act of treason. If treason consists in opposing tyranny and oppression, then the Barons who took up arms against King John of England in 1215 in order to deliver the English race from his tyrannical yoke would also, on Muir’s standard, be guilty of treason. But no historian or constitutional lawyer has dared to condemn the Barons as traitors. On the contrary, they occupy a high place in the English constitutional history as benefactors who had procured for the English people from the King the Magna Charta which, according to the historian Hallam, is the “key-stone of English liberty”. Its great underlying principle is that the King must keep the law. Although according to the laws of England King John was not a usurper, yet the Barons are hailed as hero’s sincerity of purpose in revolting against King’s misrule. But Yazid, in the eyes of Islam was a usurper who had defied every law of the Koran which is the basis of the faith. According to the Muslim code no Caliph, however rightful or legitimate, can demand allegiance from the Muslims without himself “keeping the laws” of Islam. If the English Barons occupy a high place in the English history because of their revolt against an oppressive Monarch, Hussein and his little band of followers occupy a much higher place in the hearts of millions of human beings of every age and time for refusing to bow down to the forces of evil. The English Barons procured for their nation the Magna Charta. But Imam Hussein bequeathed to the entire humanity a greater charter of rights, rights not backed by might, but sanctified by truth, courage and honesty. It is a charter of freedom, of independence, of sacrifice, of love of selfless devotion to duty, of preference of death to dishonor. It tells us that a just cause should be held dearer than life itself, that a man should live for a cause and if necessary die for it. This is an imperishable charter, it is a charter for the entire humanity. The great Imam wrote an eternal charter with his life blood.